Want to get free from the burden of searching a hotel after a long and tiresome journey? Then come to Ushodaya Tours & Travels and be rest assured for it. 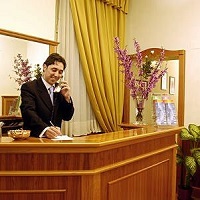 We specialize in providing hotels with world class facilities and customer satisfaction is our major concern. We have variety of option for bookings such as 5 Star Hotels, 3 Star Hotels, 2 Star Hotels, Guest house, Luxury Resorts and Motels. We even provide tent camping facility. Our main areas of operation are Ahmedabad, Bangalore, Bhubaneswar, Chennai, Cochin, Delhi, Hyderabad, Indore, Jaipur, Jammu, Kolkata, Madhurai, Mumbai, Nellore, Nagpur, Pune, Shirdi, Srinagar, Tirupati, Trivandram, Vijayawada, Visakhapatnam.